With little life, or indeed scientific, experience you might ask yourself how much benefit an early career researcher could really get out of spending three weeks at huge institution which is responsible for undertaking world changing agricultural research. 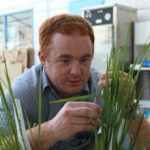 David Gale did before a recent trip to the International Rice Research Institute (IRRI), supported by the Crawford Fund and Graham Centre. On returning to Australia, Mr Gale reported to the Crawford Fund that he entered the course expecting to gain knowledge about research in rice productions systems but came out understanding this process “because someone didn’t just talk about it, they let me try it for myself”. A passion which he says involvement in this course has driven him to further pursue. 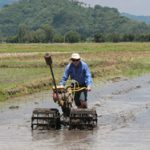 David Gale, or Dave as most people know him, is currently undertaking a PhD investigating the ameliorative affects of compost application to Acid Sulphate Soils in Southern Vietnam. This project is something of an extension of his honours (similar to Masters) research project which looked more broadly at the agronomic benefits of partial substitution of synthetic fertiliser with compost in a Vietnamese baby corn cropping system. In the two years between finishing his honours and beginning his PhD, however, Dave worked for the state department of agriculture in greenhouse (i.e. soil-less) horticulture. His long term goal is to undertake “agricultural research projects at a community level in developing countries”.